A creamy peanut caramel dip complements fall's crisp apples perfectly. I used to make a dip using those individually wrapped caramels. 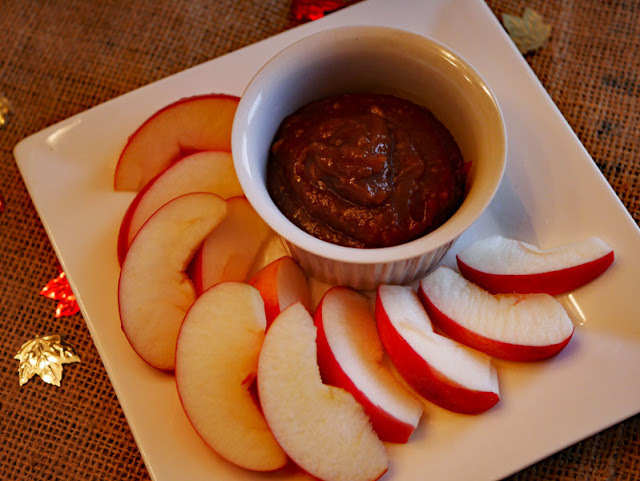 Recently, while laying in bed one morning I wondered why I couldn't make a similar dip using a caramel sauce. So I gave it a try and this is the result. Dark caramelized sugar, cream, vanilla, a bit of butter, and peanut butter. I'm sure that it took less time to make than unwrapping all those caramels. Place the sugar and water in a small, heavy-bottomed saucepan. Heat over medium-high heat, without stirring, but occasionally picking up the pot and swirling the mixture, until the sugar caramelizes to a deep golden brown. Remove from the heat and immediately add the cream. It will bubble like crazy, but stir it in until smooth. Add the butter and stir. Add the peanut butter and vanilla; stir until well combined. The mixture will thicken a little as it cools and can be reheated gently if it gets too hard. If you find that your mixture is too thin, add more peanut butter. Different brands may produce a different result. Serve with apple wedges - it would also be good with pineapple, pears, and other firm fruits.